Enjoy lounging around or spending time with great company as you wear your very own Embroidered Hope Breast Cancer Awareness Hooded Sweatshirt. Our Breast Cancer Awareness Sweatshirts are perfect for staying comfortable and looking great while raising awareness and giving hope to anyone affected by cancer. Our Breast Cancer Awareness Hoodie is a great way to support the fight against breast cancer. 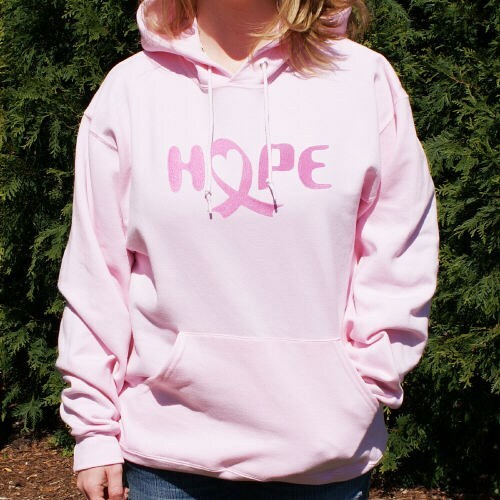 This Embroidered Hope Breast Cancer Awareness Hoodie is available on our premium cotton/poly blend hooded sweatshirt, machine washable in youth sizes S-L and adult sizes S-2XL. The sweatshirt is a good quality and I like the looks. There was a defect in the sweatshirt, the cuff was falling apart. I notified customer service and they told me they would mail another one immediatly. very nice, thank you! I love this hoodie! I hesitated before spending $35 on ANY hoodie. But, the thickness of the material and the embroidered "HOPE" are beautiful! Additional Info The breast cancer journey affects not just the person with breast cancer, but their entire support system comprised of family, friends, and health care professionals. Help spread breast cancer awareness with our collection of Breast Cancer Awareness Apparel and Walk Gear. For each item purchased, MyWalkGear.com will donate a portion of the proceeds to the funding of research and treatments to help those who need us the most. Be sure to also take a peek at our Hope Awareness Throw Blanket and our Engraved Hope Awareness Compact as well.